This guide is for commissioners of liaison and diversion services for young people including services linked to police, Police and Crime Commissioners, Youth Offending Teams and young people’s health services. It will also be relevant to any commissioner or service lead who wants to make sure that their services are designed in a way that is accessible and relevant, and which meets the needs of, vulnerable young people who have had, or may in future have, contact with the youth justice system. In 2016 Peer Power was commissioned by NHS England (London) to engage young people who had been in contact with the youth justice system in sharing their experiences to inform the future design and delivery of health and wellbeing services for young people in the justice system. The engagement, delivered in partnership with ClearView Research and published as ‘Just Health- an enquiry into the emotional health and wellbeing of young people in the youth justice system’, engaged both professionals and young people and generated a set of recommendations. One of the leading recommendations was for the redesign of liaison and diversion services to better meet the specific needs of young people. 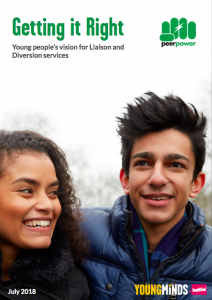 This guide follows on from ‘Just Health’ by engaging young people in exploring what those redesigned liaison and diversion services should look like.